Gen Con closed a week ago, and incoming reports tell of fantastic games, exciting adventures, and fabulous socializing, claiming it as the best one yet! The Sagamore Ballroom rang with the sounds of dice, accents, and roleplaying. I've yet to return to Seattle, as I'm spending time with my family—but I've got Internet access and my laptop, and will be returning in time to participate in PAX West! More on that later, but let's cover Gen Con 2016 first! 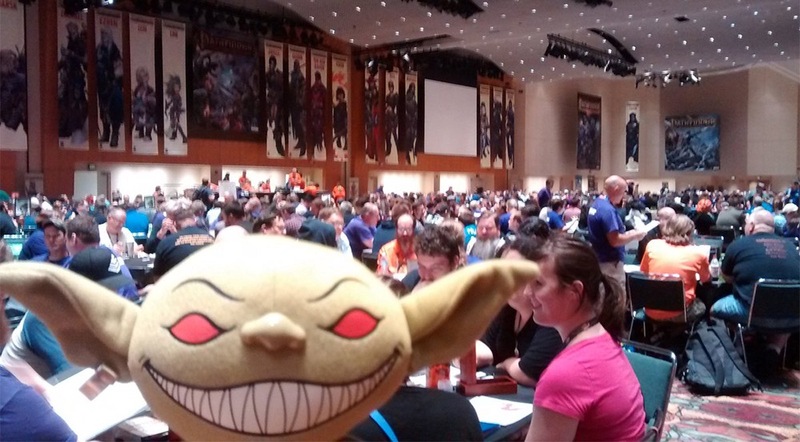 Huge congratulations to the team of volunteers that worked diligently through Gen Con. From Leads Bob Jonquet, Jon Cary, and Todd Morgan to Department Heads Bobby Harring, Dominick Trascritti, Kevin Hanley, Lucas Servideo, Seth Brummond, and Walter Sheppard to the hundreds of GMs and HQ volunteers. My deepest thanks to everyone that contributed from set up to tear down to bring the show together. There is no way to run an event the size of Gen Con without many hands. Thank you to all who gave of their time so that others may play in the world's largest organized play campaign! Several months back, I wrote a blog on volunteerism and what the Campaign Coins meant to me. Some of our most outstanding volunteers received their coins in prior years. Thus, the formation of the Order of the Wayfinder, an award above the Campaign Coin with which the Pathfinder Society team may recognize those volunteers whose service goes above and beyond and without whom it would be impossible to run the Society. The premier inductee of the Order is Bob Jonquet, whom I many never thank enough for his tireless hours as Regional Venture Captain and Gen Con lead. Any hour of the day, whatever the issue we need assistance with, he is there to help and support. To Bob, our deepest thanks and appreciation. Congratulations! Several game masters reached their 5-star milestone over the past few weeks. These GMs dedicate hours to the game, running 150 sessions, 50 of which must be different scenarios, and 10 special events. The time commitment that goes into preparing and delivering games deserves a cheer and a round of applause! As many of you who read the new Roleplaying Guild Guide noticed, the formatting changed quite a bit, and a few new rules found their way in as well. These new rules received mixed reviews, and specifically, applying credit from playing a pregenerated character. As with other initiatives and programs, I am open to feedback on how they work in the field, and as with other initiatives, I will revisit them in six months to see how they are working. Constructive feedback based on observation will help us the most, and we know that not all of our decisions will please everybody, but this was an issue that needed addressing. Another change in the Roleplaying Guild Guide involves the Pathfinder Society Community Policy. The goal of the policy is to create an inclusive environment for our players while leaving options open for communities to have the flavor of Pathfinder Society that they desire. The new policy puts the burden of good behavior on each individual player, with consequences for players not interested in fostering a community spirit. It also puts weight on the GM to regulate the table and ensure that no one is being excluded from play. So if you want to play edgier concepts, recognize the time and place for them. A public venue with new players may not be the right time to bring out the man-hating cleric of Calistra, elf supremacist, or Zarta Dralneen's newest enthusiast—save those characters for a private game with people you know. "My character would act that way" is not an excuse to abuse other Pathfinders, and when choosing which character to play, consider your environment and the other players at your table and select appropriately. With the inclusion of a more defined community behavior policy, we are rescinding the limitation on slaver and torturer professions. This does not lift the restriction on Pathfinders purchasing slaves. The reason for this inclusion in the campaign is that they are an ingrained part of the economy (slaver) and religious observance for Kuthonites (torturer). Again, as with other changes to the campaign, please send feedback and let me know how this is working in your area. If it becomes evident players are not able to have this content and treat it in a responsible manner, then it will once again be removed and offending players subject to disciplinary action. If you're in the Seattle area over the Labor Day weekend and attending the show on September 2nd to 5th, please stop by and say hi! And if you'd like to volunteer for us at the show for either the Roleplaying Game Guild or the Adventure Card Guild, send me an email and I will pass it onto the leads (Louis Manko Levite or Stacey Buxton). I hope everyone is getting a chance to wrap up Year of the Serpent and get ready to ride the tempest that is Year of the Stolen Storm! So, do ALL modules now have a campaign mode? Including The Emerald Spire and the smaller modules? The new guide seems to say so, but I would really appreciate an official answer. Or at least let me know if you are thinking on it. These new rules received mixed reviews, and specifically, applying credit from playing a pregenerated character. I was wondering if a part of the Blog got left out. It's not necessarily that these new "changes" received mixed reviews. It's more like we're unsure what they actually are. Any upcoming clarifications? The two biggest I can think of involve using "character resources" to clear conditions obtained while playing a Pregen, and exactly how Pregen credit may be applied. Also, there's a discrepancy in applying Tiered Chronicles. One section states that characters must fall within the Tier of the Chronicle, and another section states that Level 2 PCs may receive credit for Tier 1 Chronicles. Congrats to all the coin recipients and double congrats to that Bob guy! But as you say there are also plenty of cases where things were just unclear and clarifications are needed. Hopefully the appropriate questions will get reposted (but without arguments). Congratulations to the new 5 Star GMs, Campaign Coin recipients, and Bob Jonquet as the first member of the Order of the Wayfinder!! Whilst I understand the desire to let some rules (e.g. pregens must be applied to a character chosen at the start of the game) a period of play to see how they bed in, other rules in the guide need explanation now. To take examples from the message boards; with Wayfinder stats no longer in the guide, is ownership of a Sourcebook required? And, how are the pooling resources rules meant to work? Congrats to all of the new 5-star GMs! Congrats to the Campaign Service Award recipients! And congrats to the Order of the Wayfinder inductee - it's a great idea to have an award that isn't based on length of service. * pregen credit - how does this actually work? Both for pregens in regular games, and for pregen-only specials. * Wayfinders - legal without another source book, or not? * pooling resources: is the list of items given exhaustive or not? Can it be done in advance, or only for reimbursement? What happens to items that aren't used during the scenario? I see a lot of worthy names here! Congratulations to all, especially Bob Jonquet! Enjoy your time with your family, Tonya. There'll be plenty of time to get clarifications when you come back to us. This is even more interesting for CORE campaign, where there is no longer any legal source for having a Wayfinder, unless the reference counts for it. Negatory if you play the confirmation you get cert access to a wayfinder. There are also other carted way finders out there. *pregen credit - it works as it has in the past, but you must decide what character number is receiving credit before starting play. This works for either pregenerated iconics or pregen specials. *The wayfinder sidebar missing from the guide was an omission. It got lost when the guide was reformatted. It will be added to the next revision. *pooling resources - this was in response to a thread about using items on others during game play. It is for reimbursement. So if Player A has a breath of life scroll they use on another player, then during post game wrap up any player at the table can decide to reimburse a portion of the cost to Player A. Being reimbursement only helps with questions about items that aren't used during scenarios. We are working on a revision, as changes as large scale as were made mean things will get missed (Wayfinder), mistakes will be made (GM reroll bonus) and clarifications needed. As for the dead pregen issue - Any resources on the chronicle in question may be used to resolve the character "deductible" owed if raising a pregenerated iconic character. How this applies to pregenerated specials is something I want to discuss with the team before proceeding. Tiered Chronicles - a character must be within Tier. For Tier 1-2 chronicles on repayable scenarios and modules, you may play once at level 2. The guide is written so that we may include a campaign mode in either Adventure Paths or Modules as they are sanctioned. Each sanctioning document will list the particular modes for the sanctioned AP or module. So no, it is not universal, it depends on each individual piece. Sorry, one more clarification on this. The only two Tier 1 chronicles (other than retired scenarios) are First Steps Part 1: In Service to Lore, and Master of the Fallen Fortress. Those can or cannot be played once by a second level character? I apologize for needing to ask again, but there has been a lot of confusion around MoFF specifically. I believe from your statement that the answer appears to be that a level 2 character cannot play either of those. Congratulations to all the wonderful award recipients! Congratulations to all the reward recipients! I look forward to seeing the update on the Season 8 Roleplaying Guild Guide. I feel the organization is much better and hope you can quickly update it to resolve some of the current uncertainty mentioned by others above. Huge congratulations to all of the new Five Star GMs, Campaign Coin recipients, and especially to Bob Jonquet on Order of the Wayfinder - well deserved all around, everyone!!! The coin isn't based on length of service, either. In a three player game, if the pregen the GM runs gets killed, does the GM's PC die as well? A GM doesn't have to take a chronicle, so they don't have to apply it to a character. But as a matter of fairness, I think they should have to decide at the beginning of the game if they are going to take a chronicle. As well, if the have already taken a chronicle for that adventure, the can't take another without burning a replay star. Congratulations to the Bob Jonquet Campaign coin recipients and the new 5-star GMs. I'm excited to see where Season 8 will take us and how the newly available races will integrate with society play. Congrats to all the new 5 stars, coin recipients, and Bob Jonquet! Thanks Tonya for the quick responses to some of the pressing questions about the new guide. Thanks for the replies for the Guide and considering an update. Wait... If a GM is required to play a pregen in a game they're running to complete the table so it is run-able, they get both GM and Player credit for the same game? Is that new? GM plays a scenario: Gets play credit. GM plays a CORE scenario: Gets CORE play credit. GM runs a scenario: Gets GM credit. GM runs a CORE scenario: Gets CORE GM credit. EDIT: TL;DR: ONE Chronicle per GM/player per scenario barring unusual circumstances. Aside from GM star replays or special boons, those are the only ways one can get credit from a scenario. GMs mentioned above about 'taking' or not 'taking' a chronicle is related to GMing only -- ie, do they give themselves credit for running or not, under the same restrictions as above. If I've missed something, please correct me? Just so I'm clear: there's going to be a Guide revision, but we should expect it to take about half a year from now? So no sense in waiting for it before printing? The GM isn't getting player credit for running the pregen. Their GM credit is not dependant on the pregen surviving as it has nothing to do with whether there is a pregen there or not. This includes pooling money to buy breath of life or raise dead scrolls or potions for use in the game. This sounds very much like pooling resources to purchase items which may or may not be used -- which begs the question, who keeps the items after the scenario? It is not clear at all that this is about reimbursing items used during a game. Indeed, I would argue that the text in the Guide says something very different from your quote above. Rewriting is needed if that's what the meaning was supposed to be. Until the Guide is edited, at least we can use her quote for those that are unaware. I've already shared a few of John's clarifications from the other threads. Thanks, Tonya! That clarifies everything. Thanks for all the hard work from the team. Neither the way the guide is written nor this statement negates THIS current FAQ. If my PC or pregenerated character dies permanently, what happens? Player characters and pregenerated characters who do not return to the realm of the living receive 0 XP, 0 PP, 0 gold, and no items or boons. This is marked on their Chronicle sheet along with a note that the character is permanently dead. If a player was planning to hold the Chronicle from a pregenerated character and apply it to a lower level PC once the PC reached the level of the pregenerated character, they must either apply the Chronicle sheet immediately and report the PC as dead or assign the Chronicle sheet to a new level 1 PC (ie a new PC number) and report that character as dead. We've always had to assign credit up front, this FAQ created a clause where if that pregen died, then we could change our decision and save that character by killing off a new character. If what's been said is truly the desire of campaign management (in spite of the outcry of the 500 post thread that got locked), then this FAQ should be removed--otherwise there's really no change as the FAQ still exists. Better yet, put in strikethroughs and a note about what's changed. Just removing the FAQ might make you think it's still there you just can't find it at the moment. To the FAQ point, will the current FAQ's about PFS be adjusted to fit the new rulings of the new guide? Thanks Tonya. Hope the revised guide clarifies this! I can confirm it isn't for years of service - I've been a VL less than two years and received a campaign service coin (I'm still not sure what I did to earn this and am very humbled by the recognition). If you think that there's someone deserving in your lodge of a coin, I would definitely consider sending in a message to your RVC or Tonya about it. I as very humbled & honoured to receive mine from Tonya at Paizocon UK. The coin originally was a service reward though that changed recently & if I may echo Rigby, if there is someone who has gone above & beyond the call in making PFS in your area special let your RVC know about them!